Road Closures and Event Information for the Niles Tree Lighting and Festival of Lights Parade Friday Evening. A special event permit will be issued to the Niles Merchants Association for the Annual Niles Tree Lighting and Festival of Lights Parade on Friday, November 23, 2018. The event will begin with the tree lighting at 6:00 p.m. followed by the Festival of Lights Holiday Parade at 6:30 p.m. The Niles Merchant’s Association has added additional seating this year and the new guidelines can be found below in this message. • D St., E St. F St., G St., H St., and I St. between Niles Blvd. and Second Street. • Iron Horse Lane between F Street and J Street. • The small parking lot on the north side of the Niles Town Plaza (the large lot will be closed the majority of the day). If you park in this lot prior to the parade, you will not be allowed to leave until Niles Blvd. re-opens. J Street between Niles Blvd and Second Street will close at the time of the tree lighting at approximately 6:00 p.m. and will remain closed until 9:00 p.m., or when the parade ends. Vehicles will not be allowed to enter Niles on Niles Blvd. (off Mission Blvd.) 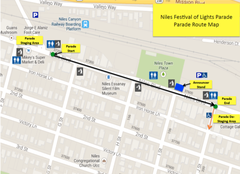 after 5:30 p.m. and Niles will only be accessible via Nursery Ave. and Niles Blvd. from the north during the parade. Please take extra precaution while driving in the area, as organizers anticipate approximately 15,000 people, many of whom will be children, in attendance. Detour signs, City staff and volunteers will be on site to help divert drivers around the road closures. Arriving early and carpools are highly recommended. These guidelines have been drafted by the Niles Merchant’s Association out of consideration for the merchants doing business in Niles and parade attendees. Over the last several years, this event has grown in size and seating has become increasingly more challenging. Last year seats were placed along Niles Blvd. several days in advance and several went missing. Additionally, our sidewalk space is limited and persons with disabilities are having more difficulty traversing the crowds standing and sitting along Niles Blvd. The great news is that a new seating area has been developed along the east side of Niles Boulevard as a trial this year! The hope is that this effort will provide new seating and alleviate the sidewalk space on the west side of Niles Boulevard. (the side where the shops are located). Please read the details below for additional information on that seating and help spread the word. • All sidewalks are to remain open to the general public. • Chairs cannot be placed before 12 noon on Friday the day of the parade along the parade route. Any unoccupied chair placed along the parade route before 12 noon is subject to removal by parade organizers. Parade organizers are not responsible for lost chairs. • Seating can be reserved with chairs/blankets beginning at 12 noon on Friday. Seating/blankets can only be placed along the curb and may not exceed one row. Sidewalks must remain accessible to pedestrians and people with disabilities. • Reserved seating is at your own risk. The police department will not take reports for lost or stolen chairs. • Seating on public sidewalks may not be reserved and then sold to members of the public. All seating must remain free and available to the general public. • NEW: At 4 PM when Niles Blvd. officially closes, City Maintenance will cordon off three sections of parking stalls along the commercial side of Niles Blvd. between J Street and G Street. After 4 PM, community members can use the designated parking spaces for cushions and blanket seating. No chairs will be allowed in this area. The goal of this trial seating arrangement is to alleviate the impact of people standing and sitting on the sidewalks and to allow for wheelchairs to freely access the sidewalks. Delineators and tape will be placed along the roadway as a barricade between the seating and parade participants. This is a one-year trial and we ask that no one touch or move the barricades. During this parade and all other Fremont events, we ask that community members remain aware of their surroundings and report suspicious activity by calling our non-emergency number at 790-6800 and selecting option 3 or dialing 9-1-1, if you believe you are witnessing a crime in progress. "If you see something, say something“. You can also text-a-tip by texting: Tip FremontPD followed by your message to 888777.